Autumn 1969. The Vietnam War continued. Protests continued. 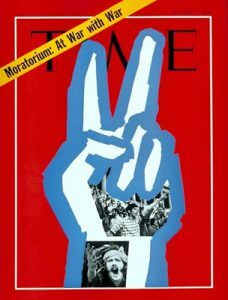 David Hawk and Sam Brown, two antiwar activists, forged a broad-based movement against the Vietnam War called the National Moratorium. The organization initially focused its effort on 300 college campuses, but the idea soon grew and spread beyond the colleges and universities. Hawk and Brown were assisted by the New Mobilization Committee to End the War in Vietnam, which was instrumental in organizing the nation-wide protest. President Nixon urged Americans not to “buckle under” or “run away” from a “fair peace.” Senate minority leader Hugh Scott (R-PA) scolded protesters they encouraged the US to “cut and run” and capitulate to the enemy. Keep in mind that in 1969 TV for most people meant only nine letters: ABC, CBS, and NBC. If you didn’t see something there it wasn’t important. None of those networks planned on live coverage of the October 15 National Moratorium. In New York City, as in many large urban areas, local electronic media did cover the event. For example alternate rock station WNEW-FM suspended all advertising for the entire day. WOR-TV devoted more than seven hours to coverage. WBAI-FM covered the event in its entirety. Vietnam is 11 hours ahead of Eastern time and so when a group of 20 young Americans assembled in front of the American Embassy at 10 AM on October 15, 1969, the National Moratorium began. In New York City, the New York Times headline was that “Tommie Agee’s Bat and Glove Lead Mets to Second World Series Victory.” Baseball fans across the country would be able to see game four that night and watch the Amazin’ Mets take a 3 – 1 lead on its way to an improbable World Championship. On April 28, 1970, Nixon authorized U.S. combat troops to cross the border from South Vietnam into Cambodia. On April 30 Nixon announced that invasion and the expansion of the war. On May 1 protests erupted on campuses across the US. 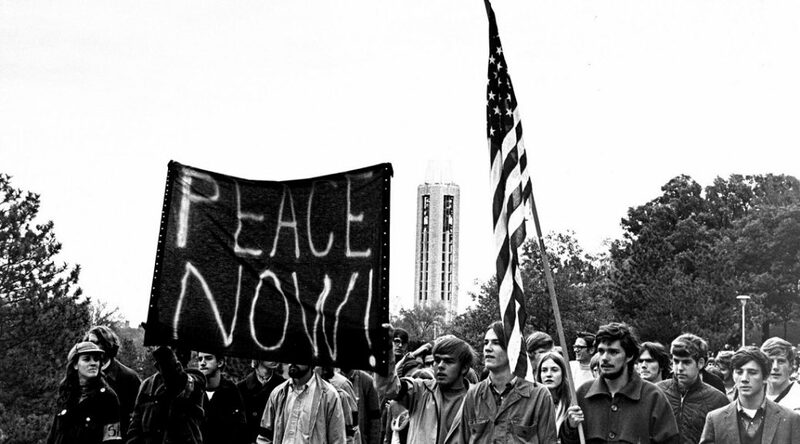 On May 3 during a press conference, the Republican governor of Ohio, James A. Rhodes, called anti-war protesters “the worst type of people we harbor in America, worse than the brown shirts and the communist element.” Rhodes ordered the National Guard to quell a demonstration at Kent State University. On May 4, 1970, National Guard troops shot and killed four Kent State students protesting the war. On May 6 hundreds of colleges and universities across the nation shut down as thousands of students join a nationwide campus protest. Vice-President Spiro Agnew stated, “We have listened to these elitists laugh at honesty and thrift and hard work and prudence and logic and respect and self –denial. Why then are we surprised to discover we have traitors and thieves and perverts and irrational and illogical people in our midst? 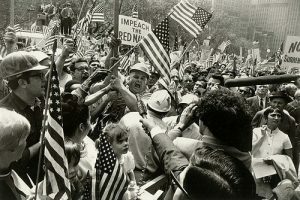 On May 8 about 200 construction workers in New York City attacked a crowd of Vietnam war protesters. Some workers use pipes wrapped with the American flag. More than 70 people were injured, including four police officers. Peter Brennan, head of the New York building trades, was honored at the Nixon White House two weeks later. He later became Secretary of Labor. On May 15 in Jackson, Mississippi police confronted a group of student protesters. The police opened fire, killing two students. On May 20 around 100,000 people demonstrated in NYC’s Wall Street district in support of the war. Apparently a person’s date of death is easier to determine than the date a war began. Richard B Fitzgibbon Jr fought in World War II in the Navy. 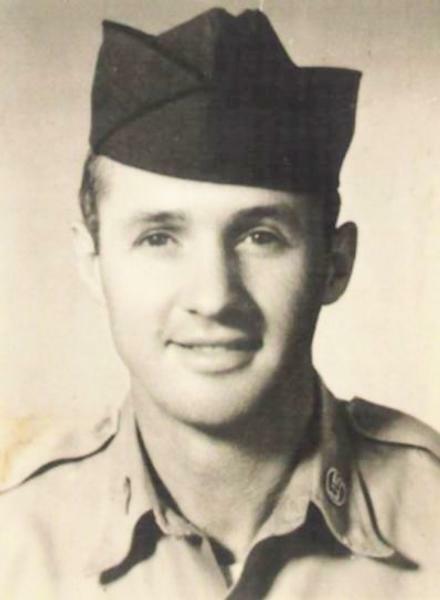 After the war he joined the Air Force and was eventually promoted to Technical Sargent. He served in Vietnam as part of the serving as part of the Military Assistance Advisory Group (MAAG), the advisors to the South Vietnamese army. When the Vietnam Memorial was in its planning stages, one of the obvious decisions was “Who was the first American killed in Vietnam?” It would seem obvious that Fitzgibbon would at least have been one of the first if not the first. Chronologically, he was as no other American military person had been killed in Vietnam since the US Government had begun sending MAAG personnel on September 3, 1950. 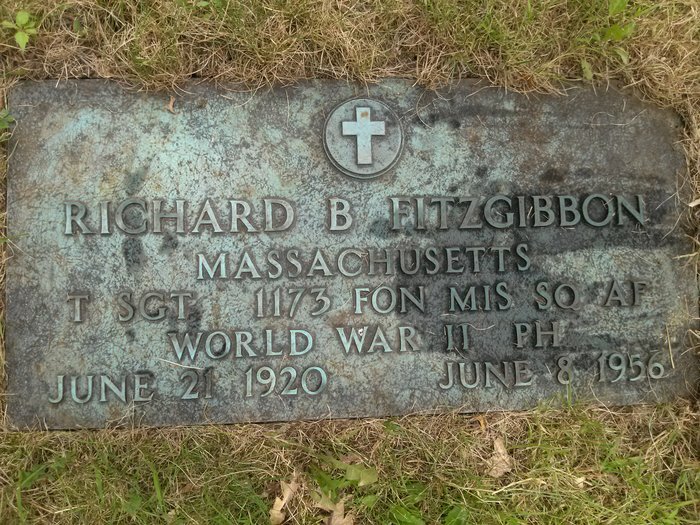 For years, the Fitzgibbon family argued that Richard should be included. Finally the Department of Defense decided to use the start date November 1, 1955, thus qualifying Fitzgibbon. Fitzgibbon’s son, Lance Cpl. Richard B Fitzgibbon III, joined the Marines because he wanted to connect to the place where his father had died. Fitzgibbon III was killed in combat on Sept. 7, 1965, in Quang Tin, Vietnam, at the age of 21. 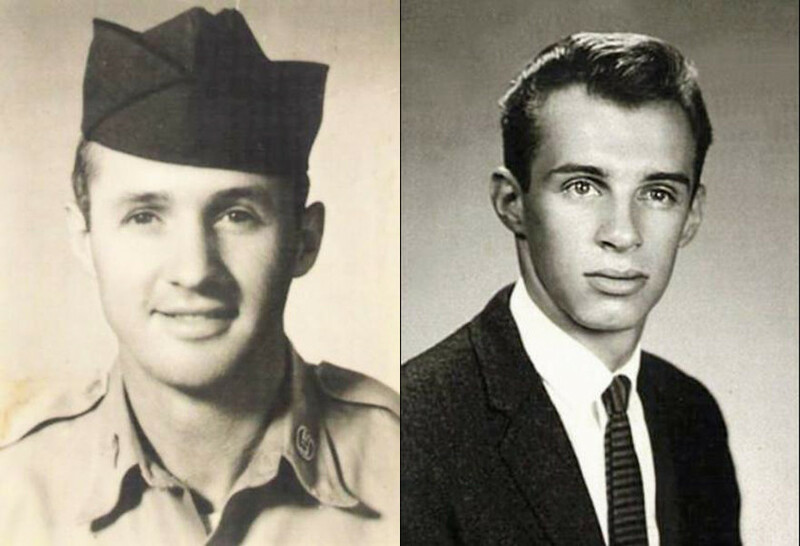 The Fitzgibbon father-son deaths in Vietnam were one of three pairs: Leo Hester Sr. and his son Leo Hester Jr and Fred C. Jenkins and his son Bert M. Jenkins were the other two. May 4, 1970. Life ended suddenly and horribly for Allison Krause, Jeffrey Miller, Sandra Scheuer, and William Knox life on the Kent State (OH) campus. Like any historic event, the story was not a spontaneous one. The story had a lead up. Ohio Governor James A Rhodes, first elected in 1963, had what was known then as a “law and order” view of unrest. Keep in mind the days preceding May 4. As promised by the newly-elect President Nixon, the Vietnam War seemed to be winding down. Then in late April of 1970, the US invaded Cambodia and widened the Vietnam War. Nixon announced the invasion on April 30, l970. The next day student protests erupted on many college campuses. Kent State University was one of those place. Students planned a second rally for noon Monday 4 May. Saturday 2 May. Kent Mayor Leroy Satrom asked Governor Rhodes to send in the Ohio National Guard. Stationed close by, the Guard arrived that evening to the burning of the University’s ROTC building. That evening confrontations between protesters and guardsmen occurred and once again rocks, tear gas, and arrests characterized a tense campus. May 4 was simply another day in most ways. People awoke. Ate breakfast. Began their day. “ABC” by the Jackson 5 was Billboard’s #1 single. Ironically, Simon and Garfunkel’s “Bridge Over Trouble Water” was the #1 album. The tragedy of May 4 would leave us perplexed, shocked, and with many questions. Did the National Guard need to shoot? Were their lives in danger? Why were between 61 and 67 shots were fired in a 13 second period? Should the Guard have been on campus to begin with? No legal proceedings ever found the Guard culpable and the January 1979 monetary settlement paid out of court by the State of Ohio was termed an apology, not an admission of guilt. 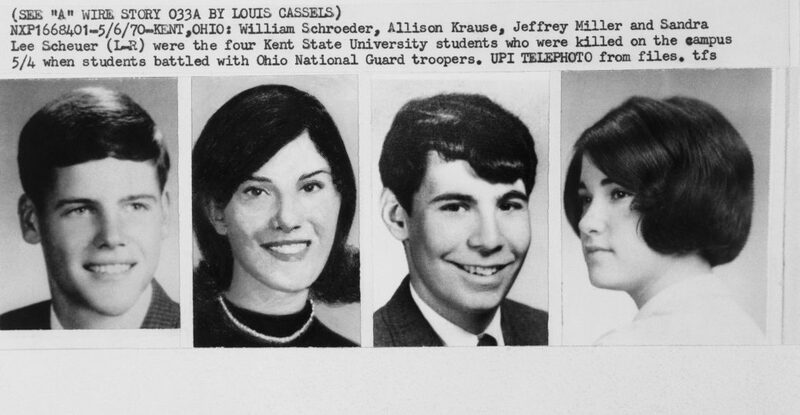 Regardless of any possibilities, for Allison Krause, Jeffrey Miller, Sandra Scheuer, and William Knox life ended suddenly and horribly on May 4, 1970.